You name the word or phrase that fits into one of our blog posts and it becomes a permanent feature of that post. We blog dozens of times a day, with up to 49 co-authors on one blog. When the word or phrase comes up in a new blog entry, we link it to your website for $25 per link. The post stays active until archived per the rules of the vendor. For most blog posts this is at least one year. Over the years we have published a number of sub-domains. You write the contextual link for the homepage of the site and we will publish it and link it to your website. Two years for $25. HUNTSVILLE, Ala. -- NASA extended the Unified NASA Information Technology Services, or UNITeS, contract with Science Applications International Corp. of San Diego. The sole source contract extension provides agency-wide information services and integration support for the NASA Information Technology Service Network. The extension also supports the NASA Enterprise Applications Competency Center by providing system administration and mainframe operations administered by NASA's Marshall Space Flight Center in Huntsville, Ala. This extension begins Feb. 1 and includes an eight-month base period valued at approximately $36.4 million. The action extends the contract period of performance by a potential 14 months for the continuation of activities through March 31, 2012. If all options are exercised, the period of performance will end in March 2012 with a potential value of $62.7 million. The UNITeS contract began Jan. 1, 2004 and has a total value, including this extension, of approximately $1.4 billion. Marshall's responsibilities for information technology include managing software applications; web and computer server systems; audio-visual information; telecommunications; information technology procurement and security; documentation storage; protection hardware maintenance; encryption security systems; computer networking; and digital imaging. HOUSTON -- NASA will exercise a one-year extension option for a contract with Computer Science Corporation of Fort Worth, Texas, to provide aircraft maintenance and modification support. The extension is valued at $54 million. The aircraft supported are operated at NASA's Johnson Space Center in Houston; NASA's Dryden Flight Research Center in Edwards, Calif.; and NASA's Langley Research Center in Hampton, Va. The aircraft are used for astronaut crew training and NASA flight research. Work under the contract is performed at Johnson, Dryden and Langley, as well as NASA facilities in El Paso, Texas. The Aircraft Maintenance and Modification Program contract provides for the continuity of services for flight line, intermediate and depot level maintenance, repairs, modifications and engineering support on aircraft. The option exercised on the cost-plus-award-fee contract begins March 1 and will continue through Feb. 29, 2012. Qualified Technical Services, Inc. of Houston is a subcontractor for the work. The base contract, valued at $104.8 million, began Sept. 1, 2009. For information about NASA and other agency programs, visit http://www.nasa.gov. At NASA's Kennedy Space Center in Florida, preparations for space shuttle Discovery's rollout from the Vehicle Assembly Building to Launch Pad 39A are under way. Teams are not working any issues that would delay the shuttle's move. First motion to the pad is expected at 8 p.m. EST and will be shown live on NASA Television (www.nasa.gov/ntv). Tropical Storm Anthony made landfall in Queensland, Australia this past weekend, and now the residents are watching a larger, more powerful cyclone headed their way. NASA's Terra satellite captured a visible image of the large Tropical Cyclone Yasi late yesterday as it makes its way west through the Coral Sea toward Queensland. The Moderate Resolution Imaging Spectroradiometer (MODIS) instrument that flies aboard NASA's Terra satellite captured an image of Cyclone Yasi on Jan. 30 at 23:20 UTC ( 6:20 p.m. EST / 09:20 a.m. , Monday, January 31 in Australia/Brisbane local time). Although the image did not reveal a visible eye, the storm appears to be well-formed and also appears to be strengthening. Warnings and watches are already in effect throughout the Coral Sea. The Solomon Islands currently have a Tropical Cyclone warning for the provinces of Temotu, Rennell& Bellona, Makira and Guadalcanal. The Australian Bureau of Meteorology has already posted a Tropical Cyclone Watch from Cooktown to Yeppoon and inland to between Georgetown and Moranbah in Queensland, Australia. The Australian Bureau of Meteorology expects damaging winds to develop in coastal and island communities between Cooktown and Yeppoon Wednesday morning, and inland areas on Wednesday afternoon. Updates from the Australian Bureau of Meteorology can be monitored at the Bureau's website at www.bom.gov.au. 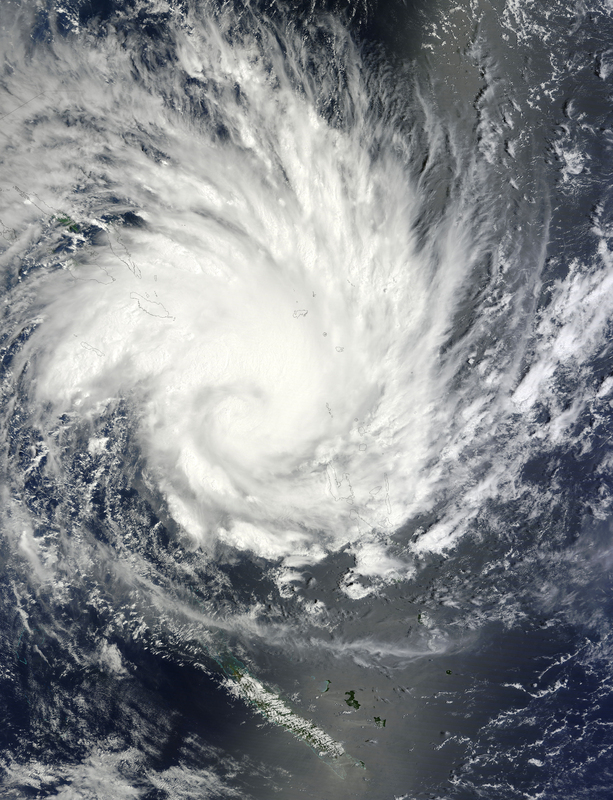 On January 31 at 1500 UTC ( 10 a.m. EST / 1:00 a.m. Tuesday February 1, 2011 in Australia/Brisbane local time), Tropical Cyclone Yasi had maximum sustained winds near 90 knots (103 mph/166 kmh). Yasi is a Category Two Cyclone on the Saffir-Simpson Scale. It was centered about 875 miles E of Cairns, Australia, near 13.4 South latitude and 160.4 East longitude. It was moving west near 19 knots (22 mph/35 kmh). Cyclone-force winds extend out to 30 miles (48 km) from the center. Animated infrared satellite imagery, such as that from the Atmospheric Infrared Sounder (AIRS) that flies on NASA's Aqua satellite, showed deep convective (thunderstorm) bands wrapping tighter into the low level circulation center. Wrapping bands of thunderstorms indicate strengthening. Yasi is forecast to move west then southwestward into an area of low vertical wind shear (strong wind shear can weaken a storm). Forecasters at the Joint Typhoon Warning Center (JTWC) expect Yasi to continue strengthening over the next 36 hours. JTWC forecasts a landfall just south of Cairns as a large 100-plus knot (115 mph/185 kmh)n system by Wednesday. Residents along the Queensland coast should now be making preparations now for the storm's arrival. Meanwhile, at NASA's Johnson Space Center in Houston, the STS-133 crew is in the virtual reality lab today rehearsing robotic techniques that will be conducted during the second spacewalk by Mission Specialists Steve Bowen and Alvin Drew. Discovery and its six astronauts are targeted to launch on the STS-133 mission to the International Space Station on Feb. 24. 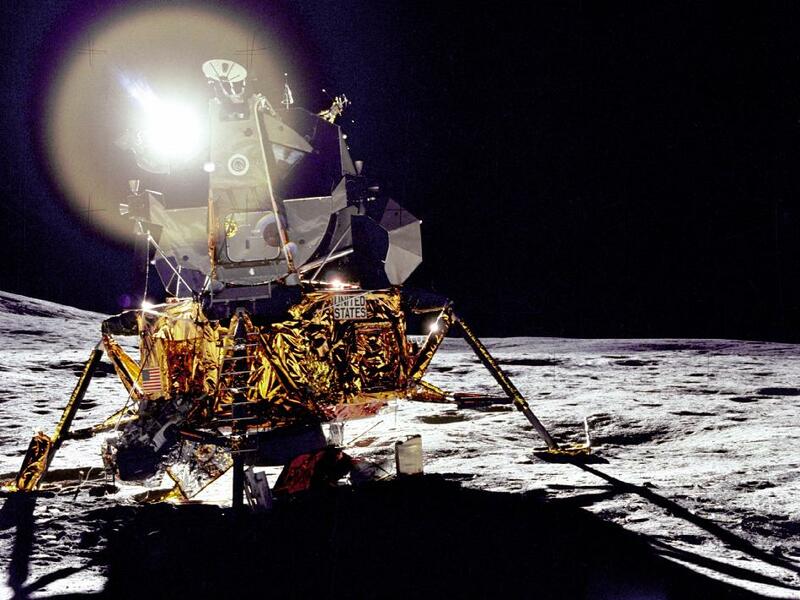 This view of Antares, the Apollo 14 Lunar Module as it sat on the moon's Frau Mauro Highlands, reflects a circular flare caused by the brilliant sun. The unusual ball of light was said by the astronauts to have a jewel-like appearance. At extreme left, the lower slope of Cone Crater can be seen. WASHINGTON -- NASA Administrator Charles Bolden today visited the MathScience Innovation Center in Richmond, Va., to meet seventh and eighth-grade students from the city's Albert Hill Middle School. Bolden discussed his military and space career and the importance of science, technology, engineering and math, or STEM, education for tomorrow's careers. In his State of the Union speech on Tuesday, President Obama emphasized the importance of STEM education for the U.S. to compete globally and create jobs. U.S. Senator Mark Warner and U.S. Rep. Bobby Scott joined Bolden and science center executives for the event. "President Obama's call for us to win the future means we need to develop the skills and capabilities to stay competitive in the global economy," Administrator Bolden said. "Today's students have the opportunity to build and take part in tomorrow's big adventures and keep our country strong and competitive through science, technology, engineering and mathematics." STEM education is the foundation of NASA's learning initiatives, such as the Summer of Innovation (SoI) project. Begun in 2010, the project engages middle school students in STEM studies and hands-on, or participatory, exploration during the summer hiatus, when many lose academic skills acquired during the school year. SoI also supports a continuum of coordinated services to engage students in meaningful ways through summer and extended learning during the school year. NASA will announce this year's Summer of Innovation plans in the spring. "Americans have never been afraid of the future, and we shouldn't start now. We know what the challenges are, and we know that these new times demand new thinking and new skills, including advanced math and science," Sen. Warner said. "We need to face up to these challenges by working together to make sure that our young people get a fair chance to compete, and to win, in the race for the future." The MathScience Innovation Center's goal is to be the innovator, incubator and advocate of 21st Century math and science programs for the Virginia capital region's kindergarten through 12th grade educators and students. It also houses the Challenger Learning Center for Space Science Education. Today marks the 25th anniversary of the loss of space shuttle Challenger and her crew of seven. Before Bolden, Warner and Scott took the stage, students had an opportunity to engage in hands-on activities related to science and exploration, including a rocket-building exercise. Education staff from NASA's Langley Research Center in Hampton, Va., led the activities. Studies have shown that hands-on, experiential learning is a key factor in capturing students' interest in technical fields and inspiring the next generation to reach new heights. For information about NASA's education programs, visit http://www.nasa.gov/education. For more information about the Summer of Innovation, visit http://www.nasa.gov/soi. For information about the MathScience Innovation Center, visit http://www.msinnovation.info/index.html. Doris Ryan works at the Naval Medical Research Center. Her blog post was originally published in Naval Medical Research and Development News. Patents protect Navy Medicine’s intellectual property and allow commercial businesses to license the patent for the benefit of our warfighters and also U.S. taxpayers. Each year the Naval Medical Research Center (NMRC) Office of Legal and Technology Transfer Services (OLTS) team pursues patent protection for about 20 new inventions, and the team currently has over 50 U.S. and 20 foreign applications in various stages of the patent process. The invaluable patent application process is done behind the scenes, and when successfully completed a 20-year patent is issued by the U.S. Patent and Trademark Office that protects the unique work done by NMRC researchers. The first step in the patent application process, before any public disclosure, presentation or publication, is for researcher to fill out a couple of forms. The “Record and Disclosure of Invention” form gives the OLTS team basic information on the nature of the invention and inventorship. The “Patent Rights Questionnaire” form lets the OLTS team determine whether the federal government has sufficient rights to the invention to allow for filing a patent application. These forms are available on the NMRC website or by calling 01-319-7503 or 301-319-9433. The OLTS team then develops a detailed filing strategy to support the patent application process. U.S. patents are effective only within the U.S., U.S. territories and U.S. possessions. The NMRC plan could include a foreign filing strategy, which means filing an application under the Patent Cooperation Treaty. The strategy could also include the decision to file a provisional or non-provisional patent application. A provisional application is not examined by the U.S. Patent and Trademark Office, but it does set a “priority date” that is subsequently incorporated into follow-on applications or foreign applications and allows a protected one year window prior to filing the provision application with the Patent Office. The process of patent prosecution and follow-on applications and justifications can take three to five years or longer. Licensing can bring royalties to the laboratory and stimulates commercial development. Patent licensing opportunities include exclusive and non-exclusive rights to cutting-edge Navy Medicine technologies because many of NMRC’s patented inventions have dual use functions that meet the needs of both military medicine and the general public. Currently, NMRC has 71 active patents ranging from vaccines and drugs to medical devices with 57 percent licensed to the private sector. NMRC OLTS will offer two informational workshops in 2011. January 11 and 19; February 15 and 26 from 9:00 a.m. to 12:15 p.m.
January 13 and February 15 from 1:00 p.m. to 4:25 p.m. Rapid Response Team Tropical Cyclone Bianca appears to have currently cut ties with Western Australia as it moves west and away from land, however, forecasters believe it will boomerang southeast toward Perth over the weekend. NASA's Aqua satellite captured a visible image of Bianca and it appeared stronger and more organized now that it is away from the influence of land and headed into the open waters of the Southern Indian Ocean. 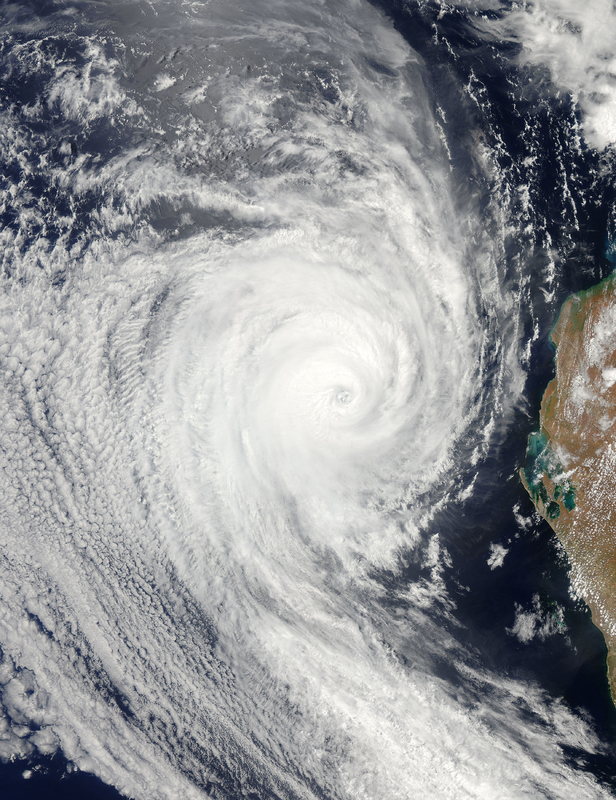 The Moderate Resolution Imaging Spectroradiometer (MODIS) instrument on NASA's Aqua satellite captured this visible image of Tropical Cyclone Bianca off the coast of Western Australia on January 28 at 06:30 UTC (1:30 a.m. EST, 2:30 a.m. January 29 Australia/Brisbane local time). Bianca had strengthened since it moved away from the coast and its center was clearly visible in the latest image. Warnings are posted for coastal areas and coastal waters. There is a Coastal Waters Wind Warning from Mandurah to Walpole. A Strong Wind Warning is also currently in effect from Mandurah to Cape Leeuwin and from Cape Leeuwin to Walpole. Winds are forecast to increase from the east-southeast between 20 and 30 knots (23 mph to 34 mph or 37 km/hr to 55 km/hr) late in the day on Saturday. Rough surf is likely with waves to 2 meters (~6.5 feet). At 1800 UTC on January 28, Tropical Cyclone Bianca was located near 26.2 South latitude and 107.7 East longitude. Bianca had maximum sustained winds near 75 knots (86 mph or 138 km/hr.) and is a Category One Cyclone/hurricane on the Saffir-Simpson Scale. It was moving south-southwest near 13 knots and is expected to turn back toward the southwest. The Joint Typhoon Warning Center forecast track takes Bianca back toward a landfall near Perth in the southwestern part of Australia by Sunday, January 30. Residents around the area of Perth should closely monitor their local forecasts over the weekend. WASHINGTON – The Department of Justice’s Office of Justice Programs’ (OJP) newly created Science Advisory Board convened its first meeting today in Washington, D.C. Created last year, the board is charged with providing OJP with guidance and recommendations for research, statistics and grant programs, ensuring the programs and activities are scientifically sound and pertinent to policymakers and practitioners. Today’s meeting provided the board’s newly appointed members with information about OJP’s mission and goals, and how their participation will enhance the overall impact and performance of OJP’s activities in criminal and juvenile justice. In Fiscal Year 2010, OJP awarded nearly 5,000 grants totaling $2.6 billion to the criminal and juvenile justice field. This funding will be used for research and evaluation programs designed to encourage innovative approaches to prevent and control crime, to assist victims, and to increase the capacity of state, local and tribal law enforcement agencies. Chair: Alfred Blumstein, Ph.D., The H. John Heinz III College, Carnegie Mellon University. Dr. Blumstein is a previous winner of the Stockholm Prize in Criminology and serves as the J. Erik Jonsson Professor of Urban Systems and Operations Research at Carnegie Mellon Heinz College. William J. Bratton, Chairman, Altegrity Risk International. Mr. Bratton most recently served as chief of the Los Angeles Police Department. Andrea J. Cabral, Sheriff, Suffolk County, Mass. Sheriff Cabral was elected as the 30th Sheriff of Suffolk County and she is the first female in the commonwealth’s history to hold the position. Frank Cullen, Ph.D., Distinguished Research Professor of Criminal Justice, University of Cincinnati. Dr. Cullen is the past editor of Justice Quarterly and Journal of Crime and Justice and was president of the Academy of Criminal Justice Sciences. Tony Fabelo, Ph.D., Director of Research, Council of State Governments Justice Center. Dr. Fabelo was a member of the National Research Council panel of the National Academy of Sciences that issued two national reports in 2000 and 2001 on juvenile crime and juvenile justice. James M. Lepkowski, Ph.D., Chair, Program in Survey Methodology, University of Michigan. Dr. Lepkowski is Senior Research Scientist at the Survey Research Center and Associate Professor of Bio-statistics at the University of Michigan. Alan I. Leshner, Ph.D., Chief Executive Officer, American Association for the Advancement of Science (AAAS). Dr. Leshner has been the chief executive officer of the AAAS and Executive Publisher of the journal, Science, since December 2001. Mark Lipsey, Ph.D., Director, Peabody Research Institute, Vanderbilt University. Dr. Lipsey is the director of the Peabody Research Institute and his research and teaching interests include public policy, program evaluation and social intervention with an emphasis on programs for children and youth. Colin Loftin, Ph.D., School of Criminal Justice, University at Albany, State University of New York. Dr. Loftin is co-director of the Violence Research Group, a research collaboration with colleagues at the University at Albany and the University of Maryland that conducts research on the causes and consequences of interpersonal violence. The Honorable Theodore A. McKee, Chief Judge, U.S. Court of Appeals for the Third Circuit. Prior to his appointment to the bench, Judge McKee served as an Assistant U.S. Attorney where he prosecuted cases of public corruption, police brutality and civil rights violations. Tracey L. Meares, J.D., Deputy Dean and Walton Hale Hamilton Professor of Law, Yale University. Professor Meares’ research and teaching interests center on criminal procedure and criminal law policy, with a particular emphasis on empirical investigation of these subjects. Edward P. Mulvey, Ph.D., Director, Law & Psychiatry Research, University of Pittsburgh School of Medicine. Dr. Mulvey is a fellow of both the American Psychological Association and the American Psychological Society. Dr. Petersilia is the author of 11 books about crime and public policy and has conducted research about parole reform, prisoner reintegration, and sentencing policy. Joycelyn Pollock, Ph.D., Department of Criminal Justice, Texas State University. Dr. Pollock began her career in criminal justice as a probation and parole officer in the state of Washington. Her primary research areas include prisons, women in the system (as professionals, offenders and victims) and legal topics. Richard Rosenfeld, Ph.D., Professor, Criminology and Criminal Justice, University of Missouri. Dr. Rosenfeld is the Curators Professor of Criminology and Criminal Justice at the University of Missouri-St. Louis. He recently served as the President of the American Society of Criminology. Dr. Rosenfeld is the co-author with Steven Messner of Crime and the American Dream, now in its fourth edition. Elizabeth A. Stasny, Ph.D., Professor of Statistics and Vice Chair of Graduate Studies in Statistics and Bio-Statistics, Ohio State University . Dr. Stasny has served on the editor boards of the Journal of the American Statistical Association and Survey Methodology. She is a recognized expert in dealing with missing data and other response errors in surveys. Robert J. Sampson, Ph.D., Professor of Social Sciences, Department of Sociology, Harvard University . Dr. Sampson is the 2011 co-recipient of the Stockholm Prize in Criminology. He and Dr. John H. Laub, Director of the National Institute of Justice, are joint winners for their work on understanding how and why criminals stop committing crime. Dr. Sampson currently is on a one-year research sabbatical from Harvard University to the Russell Sage Foundation. His research interests center on crime and violence, the life course, neighborhood effects and the sociology of the modern city. David Weisburd, Ph.D., Professor of Law and Criminal Justice, Hebrew University and George Mason University. Dr. Weisburd is the 2010 winner of the Stockholm Prize in Criminology and one of the early proponents of place-based experimental research in criminology. 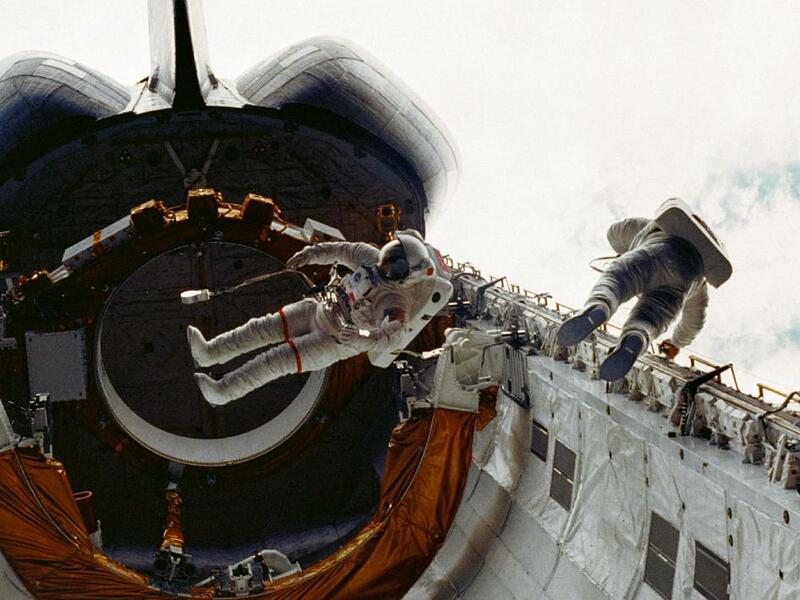 Astronauts Story Musgrave, left, and Don Peterson float in the cargo bay of the Earth-orbiting space shuttle Challenger during their April 7, 1983, spacewalk on the STS-6 mission. Their "floating" is restricted via tethers to safety slide wires. Thanks to the tether and slide wire combination, Peterson is able to translate, or move, along the port side hand rails. First called STA-099, Challenger was built to serve as a test vehicle for the Space Shuttle program. Challenger, the second orbiter to join NASA's Space Shuttle fleet, arrived at Kennedy Space Center in Florida in July 1982. Challenger launched on her maiden voyage, STS-6, on April 4, 1983 and saw the first spacewalk of the shuttle program, as well as the deployment of the first satellite--the Tracking and Data Relay System. The orbiter launched the first American woman, Sally Ride, into space on mission STS-7 and was the first to carry two U.S. female astronauts on mission STS-41-G. The first orbiter to launch and land at night on mission STS-8, Challenger also made the first Space Shuttle landing at Kennedy Space Center, concluding mission STS 41-B. Spacelabs 2 and 3 flew aboard the ship on missions STS 51-F and STS 51-B, as did the first German-dedicated Spacelab on STS 61-A. A host of scientific experiments and satellite deployments were performed during Challenger's missions. Challenger's service to America's space program ended in tragedy on Jan. 28, 1986. Just 73 seconds into mission STS-51L, a booster failure caused an explosion that resulted in the loss of seven astronauts, as well as the vehicle. Arlington, Va. (NNS) -- To cut down on convoys trucking fuel to forward operating bases, the Office of Naval Research (ONR) and elements within the Marine Corps have demonstrated their collective ability to reduce petroleum and energy usage in remote locations in Afghanistan. The energy-saving initiative reduces the amount of convoys trucking fuel to forward operating bases and supports the Department of the Navy's vision for energy efficiency. "The early results from the front indicate the ability of ONR and its Marine Corps partners to make a difference in survivability and efficiency for our warfighters," said Chief of Naval Research Rear Adm. Nevin Carr. "We have successfully transitioned commercial alternative energy systems to Afghanistan to reduce dependency on fossil fuels and batteries," he said. "By doing so, there is potential for the Marine Corps to cut back the number of resupply convoys to these remote locations and save lives by keeping Marines clear of IED attacks." Marine Corps officials said that an Experimental Forward Operating Base Executive Integrated Product Team (EXFOB EIPT) reported that results from Afghanistan have been remarkable. The 3rd Battalion 5th Marines (3/5), forward-deployed in Afghanistan, have successfully demonstrated ground renewable expeditionary energy networks (GREEN), solar portable alternative communications energy systems (SPACES), LED lighting systems, solar shades, and solar light trailers. The EXFOB EIPT is the body that guides the demonstration effort. It meets at least quarterly at the Marine Corps Warfighting Lab (MCWL), Quantico, Va. The team is planning to conduct an evaluation later this year. "The demo [was] successful because the EXFOB team trained the Marines of 3/5 on the strengths and limits of renewable and energy efficient technologies that are being employed," said Col. Bob Charette, director, U.S. Marine Corps Expeditionary Energy Office (E2O). "I believe our young Marines are more accepting of renewable energy technology because of all the discussion in the media and society regarding 'green' energy," he said. By deploying SPACES, a lightweight solar panel system which can also recharge batteries, the 3/5 was able to conduct extended patrols away from their FOB without the need for battery resupply. The 3/5 also powered two patrol bases with renewable energy. At larger sites, fuel used to power generators was reduced to two to three gallons a day, from 25 gallons, using GREENS, a 300-watt, photovoltaic/battery system which provides continuous power to Marines in the field. That resulted in a 90 percent reduction in fuel use, Marine Corps officials said at the EXFOB IPT briefing. The EXFOB is now embraced by the Marines, the MCWL, Marine Corps System Command (MARCORPSYSCOM), E2O, Capabilities Development Directorate and ONR. They have all played a vital role to ensure the concept moves forward. The idea for EXFOB was first raised in 2009 by ONR's George Solhan, deputy chief of naval research, Expeditionary Maneuver Warfare and Combating Terrorism. ONR issued a request for information (RFI) to help the Marine Corps rapidly assess industry's capabilities to provide off-the-shelf solutions. Approximately 100 vendors responded to the RFI with a variety of ideas for water purification, power generation technologies and energy-efficient shelters. ONR, MCWL, and MARCORSYSCOM subsequently selected vendors representing the diversity of potential technical solutions. ONR then extended invitations for those vendors to participate in an EXFOB demonstration at Marine Corps Base, Quantico, in March 2010. "We were looking for technologies that could have immediate impact on getting Marines off the roads hauling fuel and water," Charette said. In addition to inviting industry participants, ONR has invested $1.6 million, in both dollars and technologies, toward EXFOB. The total EXFOB cost to date is $3.9 million, Solhan said. ONR proposed establishing a "test bed" at Quantico in order to identify and demonstrate mature technologies. This concept was adopted as the EXFOB. ONR funded the initial effort and continues to support it through its Western Area Research, Test, and Evaluation Center facility at (Marine Corps Air Ground Combat Center) 29 Palms, Solhan said. Early results identified several mature "green" energy technologies, as well as several water purification systems. "More importantly, it defined follow-on EXFOB efforts at 29 Palms and provided baseline information leading to the development of the USMC Energy Strategy." he said. The second EXFOB, built in the southern California desert at 29 Palms, closely mimicked the characteristics of Afghanistan's natural environment, Solhan said. The Marines also purchased several hybrid energy technologies for this demonstration that went beyond the initial EXFOB and will show a greater savings for Marines, Charette added. For more news from Office of Naval Research, visit www.navy.mil/local/onr/. WASHINGTON, Jan. 27, 2011 – A senior Navy official yesterday criticized a major “think tank” for its outlook on the development of alternative fuel technologies and markets. Tom Hicks, deputy assistant secretary of the Navy for energy, said in a “DOD Live” bloggers roundtable that a report from the nonprofit Rand Corp. to Congress this week contained "misrepresentations and some factual errors," particularly with regard to Navy development of new fuels. The Rand Corp. failed to consult the Navy and with industry, Hicks said, and "based on [our] active engagement with industry, we have come to some far different conclusions." The Rand report erroneously describes the Navy as operating a testing program for a petroleum substitute used to make low-sulfur diesel fuel, whereas the service focuses exclusively on biofuels, Hicks said. The report also fails to link the development of alternative fuels to national security and downplays the possibility government and industry would succeed in making such fuels practical, he added. The Navy came to a starkly different conclusion after speaking with other government agencies, including the Energy Department, and with corporations and the venture capitalists that fund them, Hicks said. For one thing, he said, the American military possesses sufficient purchasing power to sometimes drive market realities, increasing the chances of developing new fuels in sufficient quantities at the right price. Though the military represents only 2 percent of the U.S. petroleum market, Hicks said, the services likely would drive market trends, given the finances of America's largest oil user, the commercial aviation industry. Hicks also emphasized that new energy would allow America to obtain energy independence. "We've been focused since October on a range of [energy] issues,” he said. “Most notably that by 2020, 50 percent of our fuel will come from alternative sources. I think we're looking at this maybe in a broader context -- from an energy independence and energy security point of view." Navy officials predict the maturation of the biofuels market within the next five years, Hicks said. MathScience Innovation Center, Richmond, Va.
WASHINGTON -- NASA Administrator Charles Bolden meets with seventh and eighth grade students from Albert Hill Middle School this Friday at the MathScience Innovation Center in Richmond, Va. Bolden will highlight the importance of science, technology, engineering and math, or STEM, education as he shares his career experiences in the military and the space program. In his State of the Union speech on Tuesday, President Obama emphasized the importance of STEM education for the U.S. to remain competitive in the world and win the future. U.S. Senator Mark Warner is scheduled to join the administrator and science center executives for this special NASA student event on Friday, Jan. 28, at 10 a.m. EST. Bolden's remarks will begin around 11 a.m. The MathScience Innovation Center's goal is to be the innovator, incubator and advocate of 21st Century math and science programs for the Virginia-capital region's kindergarten through 12th grade educators and students. It also houses the Challenger Center Learning Center Richmond. January 28 will mark the 25th anniversary of the loss of space shuttle Challenger astronauts. In his first education address of 2011, Bolden will reinforce NASA's commitment to STEM education and highlight opportunities for students who pursue those fields. STEM studies are a key part of NASA's effort to build the agency's future high-tech workforce and cultivate the next generation of explorers. In addition to hearing from Bolden and Warner, the students will have an opportunity to engage in hands-on activities related to science and exploration. Education staff from NASA's Langley Research Center in Hampton, Va., will lead the activities. WASHINGTON -- NASA will host a news briefing at 1 p.m. EST , Wednesday, Feb. 2, to announce the Kepler mission's latest findings about planets outside our solar system. The briefing will be held in the NASA Headquarters auditorium at 300 E St S.W. in Washington and carried live on NASA Television and the agency's website at http://www.nasa.gov/ntv. Kepler is the first NASA mission capable of finding Earth-size planets in or near the "habitable zone," the region in a planetary system where liquid water can exist on the surface of the orbiting planet. Although additional observations will be needed over time to achieve that milestone, Kepler is detecting planets and planet candidates with a wide range of sizes and orbital distances to help us better understand our place in the galaxy. The news conference will follow the scheduled release of Kepler mission science data on Feb. 1. The data release will update the number of planet candidates and is based on observations conducted between May 2 and Sept. 17, 2009. -- Debra Fischer, professor of Astronomy, Yale University, New Haven, Conn.
Reporters also may ask questions from participating NASA field centers or by phone. To obtain dial-in information, journalists must send their name, affiliation and telephone number to Steve Cole by e-mail at stephen.e.cole@nasa.gov by noon EST on Feb. 1. For more information about the Kepler mission and to view the Feb. 1 data release, visit http://www.nasa.gov/kepler. Science technicians in NASA Kennedy Space Center’s Vehicle Assembly Building have completed all mechanical work and foam replacement for modifications on space shuttle Discovery’s external fuel tank stringers. Teams will work on trimming operations on Friday, Jan. 28. Discovery’s rollout back to Launch Pad 39A is scheduled for Jan. 31 at 8 p.m. EST. ‪At NASA’s Johnson Space Center, the STS-133 crew is conducting an integrated post-insertion simulation today in the fixed base simulator. 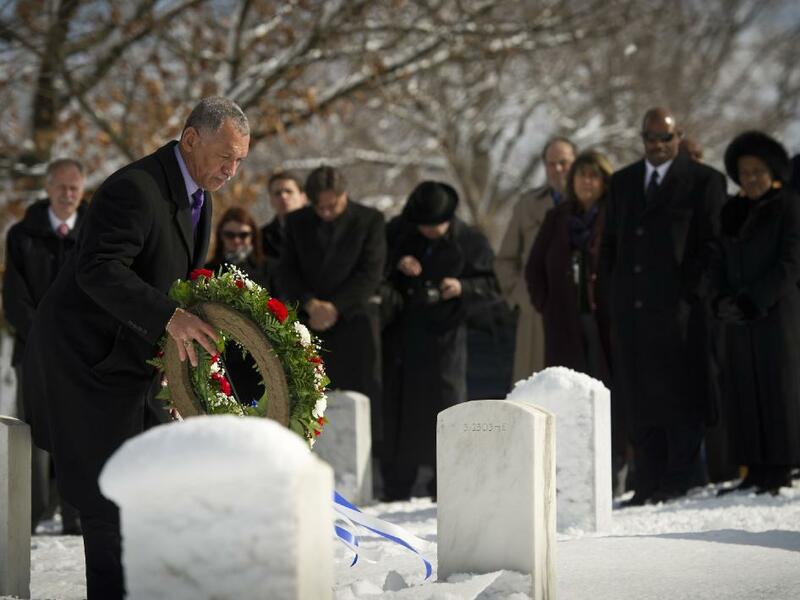 NASA Administrator Charles Bolden participates in a wreath-laying ceremony as part of NASA's Day of Remembrance, Thursday, Jan. 27, 2011, at Arlington National Cemetery. Wreathes were laid in memory of those men and women who lost their lives in the quest for space exploration. NORFOLK, Va. (NNS) -- USS Theodore Roosevelt (CVN 71) Sailors partnered with Campostella Elementary School Jan. 21, to help judge a science fair at the Norfolk area school. More than 100 students, spanning five grades, submitted projects to be evaluated by the guest judges. "When we first told the kids that the Navy would be judging them they were extremely excited," said Wartika Scott, Campostella Elementary School lead science teacher. "Then they started thinking about what to ask the Navy and what they were going to be asked, and started to get nervous; it was pretty fun to watch. You could tell that is was important to them." The Navy was equally as excited to meet the students. "It's important for us to give back to the community in different ways," said Yeoman 1st Class (AW/SW) Nicole Oliver. "We need to be out their motivating and guiding our future leaders, and events like this are ways we can help to do that." The judges engaged the students with questions about their projects and graded them based on creativity, knowledge and the scientific process. "I was really looking for creativity and if the student did the majority or all of it on their own," said Oliver. "I wanted them to be able to walk me through their projects, and show me the effort they put into learning them." Oliver said the students did not disappoint her. "I was really impressed with all of the projects," said Oliver. "They were really well thought out, and I could tell the kids knew what they were talking about and were really learning." In October 2010, the school decided to make some big changes to help the students excel at a science fair. "We became a science, technology, engineering and mathematics school, or STEM school for short," said Laguma Foster, Campostella Elementary School principal. "It's a program designed to introduce the technical fields earlier to children." Normally, students wouldn't be exposed to these kinds of lessons and classes until sixth-grade. Foster said that is too late in many cases. The schools hallways are now lined with posters from each class' science experiments. There is a garden out back with plans for a greenhouse in the summer. The school has gone "green" and cut back on waste. "The kids are really responding to the changes," said Nila Nash-Jackson, a science lab teacher. "You can really see that they are interested in what we are teaching them. It's great to see that a lot of them now dream of going into a STEM career field. That's what the program is designed to do. To show kids that there are other options out there. It's the wave of the future." "What the Navy has done is provide the end result of careers," said Foster. "Especially in the math, science, engineering and technology fields. It's great for us to have the Navy here so often to show the children one of the great options the STEM path affords them." Foster said the partnership between Campostella and the Navy is one that is built to last. "The Navy has assisted us not only on a daily bases but during special events," said Foster. "Routinely and annually the Navy has been here 100 percent." For more news from USS Theodore Roosevelt (CVN 71), visit www.navy.mil/local/cvn71/. The U.S. Navy this week criticized a major think-tank for a jaundiced outlook on the development of alternative fuel technologies and markets. Tom Hicks, deputy assistant secretary of the Navy for energy, told reporters that a report from the non-profit Rand Corporation to Congress this week contained “misrepresentations and some factual errors,” particularly with regard to Navy development of new fuels. The Rand report erroneously describes the Navy as operating a testing program for a petroleum substitute used to make low-sulfur diesel fuel, whereas the service focuses exclusively on biofuels, Hicks said. The think-tank also fails to link the development of alternative fuels to national security and downplays the possibility government and industry would succeed in making such fuels practical. Yet, the Navy came to a starkly different conclusion after speaking with other government agencies and the Energy Department, corporations and the venture capitalists who fund them, Hicks said. For one thing, the American military wields sufficient purchasing power to sometimes drive market realities, increasing the chances of developing new fuels in sufficient quantities at the right price. Though the military represents only 2% of the U.S. petroleum market, the services would likely drive market trends given the anemic finances of America’s largest oil user—the commercial aviation industry. In fact, the Navy intends to soon drive down the price of fuel to a dollar per gallon. The Navy official also emphasized that new energy would allow America to regain its energy independence while stopping the transfer of wealth to oil-rich countries sometimes hostile to U.S. interests. The Navy predicts the maturation of the biofuels market within the next five years. TAMPA, Fla. (NNS) -- Sailors from USS Constitution, U.S. Central Command (USCENTCOM) and several other local commands spoke with the Girls Scouts of West Florida Jan. 23, about some of the Science, Technology, Engineering and Mathematics (STEM) careers that are available in the Navy. This event, part of the Girl Scout Career Expo, was one of many scheduled during Navy Week Tampa Bay 2011, and it allowed Sailors to talk about the Navy and the things that the Navy does. "Our main focus is STEM: science, technology, engineering and math," said Denise Dixon, Girls Scouts of West Central Florida events pathway manager. "Trying to get the girls exposed to engineering and not to be afraid of it, we thought this [Expo] would be a good kind of flavor with them within STEP. We're really big with STEM." Talking about STEM with the Girl Scouts also provided the Sailors an avenue to show that the Navy has opportunities for women. "Our older girls have been asking for more focused, career action fun," said Dixon. "I loved that the girls were able to get exposure from various career paths within the U.S. Navy and then see that it's not just males, but their female presence. And just listening to various women talk about their career paths puts in the girls' mind, 'Hey that could be me one day.'" Six Navy divers and nine Sailors from USS Constitution, Reservist from the Navy Operational Support Center (NOSC) Tampa, Navy Recruiting District Miami, and U.S. Central Command (USCENTCOM) provided a snapshot of their lives before they joined the Navy, their current jobs and responsibilities, and what achievements a Navy career has yielded each of them to date. "I'm a boatswain's mate," said Boatswain's Mate 1st Class Jeaniel Image, a Reservist from NOSC Tampa Navy Cargo Handling Battalion. She explained to the Girl Scouts that a boatswain's mate is a, "Jack of all trades and master of none." One job she had out of high school was a big hit with the group. "I've driven the aircraft carrier as a deck seaman," said Image. "Coming out of high school I never thought in my life I would be holding onto the wheel that steers the ship with 3,000 people on board and tons of jets." She thanked the Navy for giving her opportunities to work in stressful environments. "I'm a lot more composed person," she said. "I feel the Navy gave me that confidence." "I volunteered for something different; I never worked with the Girl Scouts," said Intelligence Specialist 1st Class Veronica Burrell, USCENTCOM. "I'm glad I got to let other people know about the military and what I do." Sometimes it is difficult for an intelligence specialist to answer questions about their jobs. "They asked what we do," said Burrell. "In the intel field it's kinda hard to tell what we actually do. They thought that was the coolest part because we couldn't tell them what we do." Sailors from several commands are participating in Tampa Bay Navy Week, the first of 21 Navy Weeks planned across America in 2011. Navy Weeks are designed to show Americans the investment they have made in their Navy and increase awareness in cities that do not have a significant Navy presence. For more news from Navy Office of Community Outreach, visit www.navy.mil/local/navco/.